Background: Long term result of surgical treatment for malignancy is the most important thing even in the minimum invasive surgery. Laparoscopic gastric cancer surgery was performed widely, but its long term reults are still umknown. 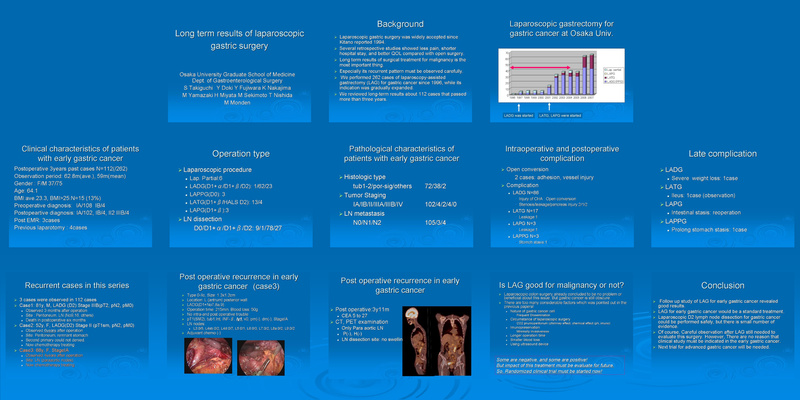 Method: We performed 262 cases of laparoscopy-assisted gastrectomy (LAG) for gastric cancer since 1996, while its indication was gradually expanded. We reviewed long-term results about 112 cases that passed more than three years. Result: An average observation period was 62.8 months, and the median was 59 months. Preoperative diagnosis was stage IA or IB entirely, but pathological diagnosis was stage IA: 102, IB: 4, II:2 and IIIB: 4. Two recurrences were observed in advanced gastric cancer, one has cancer death in postoperative six months, the other case received chemotherapy now. One case of early gastric cancer had para-aortic lymph node swelling (PET positive) accompanied with a rise of CEA in spite of being stageIA; pT1(sm)pN0. Late post operative complication was occurred in one case which was ileus without surgical treatment. Discussion: According to previous report, 5 year recurrence rate following surgical treatment for early gastric cancer is 1.9%. 0.9% that our result showed in this study is excellent. Previous studies showed its exellent early results and benefits of minimally invasive surgery.LAG for early gastric cancer will be a standard treatment. Conclusion: Follow up study of LAG for early gastric cancer revealed good results. Laparoscopic D2 lymph node dissection for gastric cancer could be performed safely, but there is small number of evidence. so next, phase II trial for safety will be needed. About long-term results of advanced gastric cancer, a phase III trial about LAG for advanced gastric cancer except neoadjuvant chemotherapy cases will be needed at last.